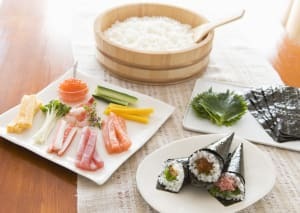 If you were travelling to Japan, or even eating at your local Japanese Restaurant, you must have wondered, “What types of sushi should I eat?” To answer that, we think sushi will be much more enjoyable if you understand all types of sushi there are and it’s differences. Especially in Tokyo, there are so many types of sushi bars from Michelin stared sushi bars, such as Sukiyabashi Jiro, Sushi Saito to family-friendly sushi restaurants with conveyor belts like Kura Sushi, Sushiro. The point is, they all serves same kinds of sushi and rolls. your experience with Sushi would be so much more pleasurable. Also, If you are planning a trip to Japan and interested in learning more about sushi, how about learning about sushi directly from professional sushi chefs? 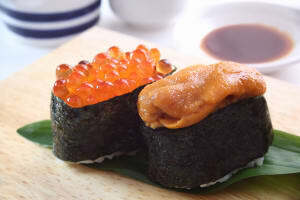 The sushi you see when you order the Ikura “salmon roe” sushi, or the Uni “sea urchin” sushi is this type of shaping style, the Gunkan Maki. After shaping the rice, you wrap it around with the seaweed and top it off with seafood which tend to crumble. This type of sushi allowed people to use toppings which were never capable of being used on a standard nigiri sushi. A Temaki Sushi is the kind of sushi where you lay out a sheet of seaweed, put your food whether it be vegetables, rice, or fish, and wrap it all with the seaweed to eat. This is the main character of the home parties in Japan because the seaweed acts out as your plate, and it easily keeps your hands clean. In Japanese, “Chirasu” means to scatter, and another way of saying “chirasu” is “chirashi”, thus “Chirashi Sushi” means scattered sushi. What you put on top of the rice in a bowl may vary from household to restaurant, but the most basic is seafood, boiled shiitake mushroom, and eggs. 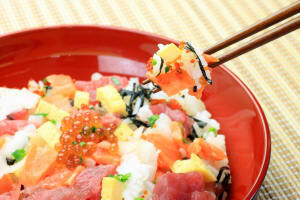 To Japanese people, chirashi sushi is more commonly enjoyed as a donburi, for example, katsudon, instead of it being enjoyed as sushi. Delicious rice, beautiful water and the trained skill of a craftsmen, all make up the Japanese spirit packed sake. Try comparing the tastes of the sake by region, north to south, and you will be pleasantly surprised by the rich flavor variations that you can enjoy. When traveling to Japan, we strongly recommend to try various breweries’ Sake because only major breweries can distribute Sake outside Japan.In Japan, we actually have so many small but shining and aspiring breweries and local people become preferring Japanese Sake made at that kind of small breweries now. You can meet surprising Sake having unique taste and flavor like fruit, chocolate, cheese etc in Japan. 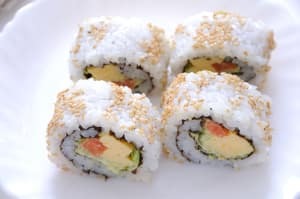 From here on out, we will introduce the strange sushi rolls. 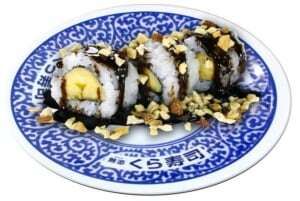 This banana roll is simply peeling the banana, and created a sushi roll out of it like any other. You can’t even imagine how it will taste just by looking at a picture… You may think some eccentric person decided to become original to make this really weird sushi but in actuality, this was a seasonal sushi offered from one of the biggest Japan’s sushi franchise. If you can find it anywhere in Japan, try giving it a chance! 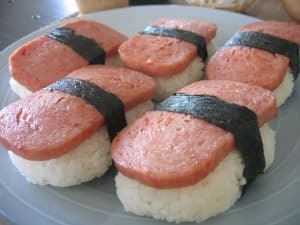 You place spam on top of the vinegared rice, which is the “spam nigiri” This is said to be originated from Hawaii. Recently in Japan’s revolving sushi restaurants, there are dishes like the Roast Beef Sushi, or even the Teriyaki Sushi, all using meats instead of seafood, so just like the trend is going, we thought this spam nigiri will also be delicious! We are probably nowhere near done creating new kinds of sushi, and once created, they will start to be available all around the world. Without a doubt, new sushi will continue to be created and continue to revolve around the world. 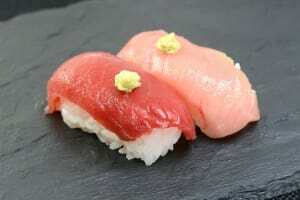 A sushi is bite size, beautiful looking, and capable of making any food in season to be eaten at it’s best quality. Reminiscent of the Japanese culture and it’s development isn’t it? When you do come to Japan, please attend a sushi lesson from a sushi chef to understand more about it’s beauty!